A callous son stole money from his father – a retired police sergeant – even though his dad had paid off tens of thousands of pounds worth of his debt. Darren Simm illegally set up an online bank account in the name of his 73-year-old father, David, and siphoned off £875 into his own account. Simm, 44, of Darbishire Road, Fleetwood, pleaded guilty to fraud. Blackpool magistrates sentenced him to a 12 months community order with 20 days rehabilitation to be supervised by the probation service, fined him £20 and ordered to him to pay £500 compensation to his father’s bank which had reimbursed his dad. Prosecutor, Pam Smith, said Simm’s father had said his son had been in debt for years due to him having a drug problem. The father said he had used his savings and got into debt to the tune of £14,000 himself to pay his son’s debts. At his son’s request he even handed over £2,000 believing this would leave his son debt free but he later learned money was used to pay for drugs for his son’s cell-mate while he was in prison. On September 1 the father checked his bank account and found it was £875 overdrawn which his son had taken out illegally. The father stated he had given his son all he could but he could not go on like that. He had found himself sleeping in his clothes with his wallet containing his bank card in his pocket. Gerry Coyle, defending, said while in prison Simm had been beaten and bullied and his cellmate had transferred a drug debt he had to the defendant. Recently the cellmate had found Simm and threatened violence and damage to the home he shared with his father. Simm did not want his father to be a target so he got money from his account to pay the other man. He then told his father what he had done and to go to the police. A son caused damage at his family home in St Annes when he was locked out of the house. 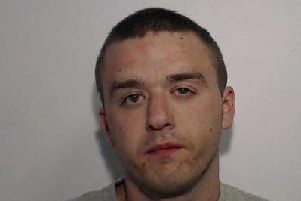 Niall Holloway, a 25-year-old cafe worker, formerly of Church Road, St Annes, now of no fixed address, pleaded guilty to damaging the locking system of a front door. He was given a 12 months conditional discharge and ordered to pay £200 compensation with £30 victims’ surcharge. A man threatened to stab a neighbour after a couple complained about his music being too loud. Ian Cowdell, 38, of Newbury Avenue, South Shore, pleaded guilty to threatening behaviour. He was fined £120 with £50 costs and ordered to pay £30 victims’ surcharge. Prosecutor, Pam Smith, said a couple who were neighbours of Cowdell’s called the police saying they had asked the defendant to turn down his loud music as it was late and they were working the next day on August 16 at 11.45pm. Cowdell had then said he would stab the man. Police found the defendant was drunk and in front of officers continue to say he would stab the neighbour. Peter Manning, defending, told magistrates that his client felt the neighbours had been impolite when they asked him to turn down his music. Cowdell had felt his niece was under threat and he had made a totally inappropriate threat to the neighbour. An angry man smashed 10 windows at flats in Fleetwood and then gave himself up to the police. Carl Starkey, 51, of Croft Court, The Court, Fleetwood, pleaded guilty to causing damage. He was fined £120 and ordered to pay £500 compensation. Prosecutor, Pam Smith, said 10 windows at ground-floor flats in Leven Avenue were broken on July 28. Starkey then went to the police station and confessed he had caused the damage. He said he was angry because property had been stolen from him. Starkey added he was mad at the time so he used a hammer to smash the windows. Starkey’s defence lawyer said his client had slight mental health problems and suffered from paranoia. A woman warned by police about begging in Blackpool town centre was found begging again 20 minutes later. Aimee Durham, 24, of Bond Street, South Shore, pleaded guilty to begging in a public place. She was fined £40 with £50 costs and ordered to pay £30 victims’ surcharge. Durham told magistrates: “There is no excuse. I’m not proud of it.” She added she now had permanent accommodation and was on a prescription to help her keep off street drugs.